By administrator in IMC Exploration Group (IMCP) on 22nd December 2015 . 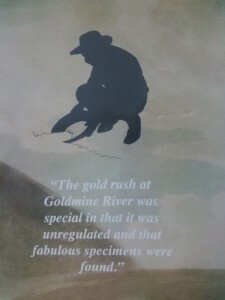 Within a few short years of its discovery, the public reputation of the Goldmine River had been brought into line with a harsh reality. 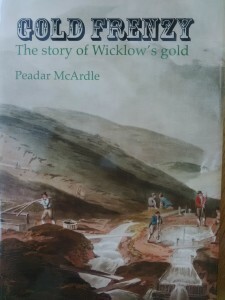 Yes there certainly was alluvial gold there, and it could be spectacular, but its quantity was limited and no local bedrock source – no Mother Lode – had materialised. Its workings were abandoned, apart from the periodic patrols of the militia stationed there. Perhaps only the surreptitious attention of nocturnal neighbours would preserve its memory for future generations. Would this be the end of the matter or could there yet be other twists to the story? A pessimistic outcome seemed inevitable and would perhaps be in keeping with the depressing disappointment of recent political and military events throughout Ireland. To understand the distribution and origin of gold in the sediment of the Goldmine River valley we must first consider its geological context. Many visitors to Dublin will take the time to explore the scenic landscape of the neighbouring Wicklow region, a landscape that many residents may take for granted and which is sculpted from its diversity of rock types. The most extensive rock group, called the Ribband Group from its striped appearance in outcrop, comprises mudstones and siltstones which have been converted to slaty rocks. They form the lower ground, mainly farmland, of eastern Wicklow as well as many of the lower hills, along many of whose forest roads it is exposed. The mountainous spine of Wicklow is formed of a very different rock – Leinster Granite, which extends to the southern suburbs of Dublin City. In the past it was extensively quarried for building stone. Among its most celebrated exposures, between Blackrock and Whiterock Beach are those at Joyce’s Sandycove Martello Tower. The green muddy sandstones of the Bray Group are well known to travellers on the M11 / N11 route where they are splendidly exposed between Newtownmountkennedy and Rathnew. Thick creamy-coloured quartzite beds also make their appearance here, but they are best exposed in the surrounding hills where they form ridges with serrated skylines, not to mention the isolated cone of the Sugarloaf Mountain which causes it to be misidentified as a volcano on occasion. Additional impure green sandstones form the Kilcullen Group in west Wicklow and extend into adjoining County Kildare. These can be inspected at the roadside in Glending, west of Blessington town, and also further south, along the N81 near Dunlavin. The final group of rocks, the Duncannon Group is among the most restricted in extent, and forms a relatively narrow zone that extends from the Waterford-Wexford coastline northeastwards to terminate around Arklow Head. It consists of volcanic rocks, the products of lavas and ashes ejected from ancient volcanos whose outlines have long since vanished. There is a second parallel, but subsidiary, zone of these rocks which is very important for our story. It extends from Croghan Kinshelagh area to Avoca, and further northeast to Rathdrum and beyond. Yes, this is Fraser’s golden zone.